At a time when the pay structure of Australia's cricketers has been questioned, Trent Copeland represents tremendous value for money. He nabbed 5 for 47 against Sri Lanka Board XI to make a compelling case for selection in the first Test in Galle next week. Possessing neither a Cricket Australia contract nor a Twenty20 Big Bash League deal, Copeland thus subsists on a state contract with New South Wales. The Argus review's recommendations about the need to use performance as the primary reason for selecting and paying players would appear to have been written with cricketers like Copeland in mind. Having forced the hand of the national selectors' via the old fashioned path of taking wickets in vast quantities, the 25-year-old Copeland also serves as a reminder that a good deal of talent remains in the Sheffield Shield, despite its apparent decline over the past handful of summers. 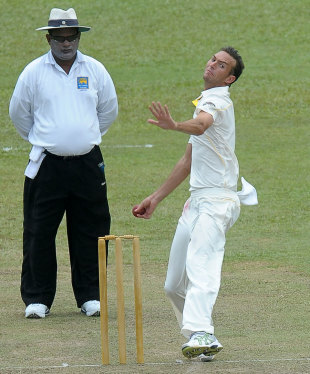 Following Copeland's incisions, the spin bowlers Michael Beer and Nathan Lyon assisted in restricting Board XI to 258 at Colombo's P Sara Oval, as captain Michael Clarke assessed his options in the field after losing the toss. Phil Hughes and Usman Khawaja then took the Australians to 26 for no loss at the close. Harris, with 2 for 39, rivalled Copeland as the sharpest member of the Australian bowling quintet, Copeland showing stamina, subtle movement and immaculate line while Harris was swift and moved the ball with bounce. Their success, and the minimal threat posed by Peter Siddle (0 for 55 in 11 overs), brought Australia's likely Test pace attack into sharper focus. Harris and Mitchell Johnson appear likely to provide the speed and Copeland the reliability. Of the Board XI's batsmen, Tharanga Paranavitana survived more than he thrived in reaching 49, and Dinesh Chandimal's 59 arrived too late to prevent his omission from the Sri Lanka Test squad after a poor run with the bat in the ODI series. The captain, Angelo Mathews, played haltingly before he was bowled by the unerring Copeland. Fielding first on a pitch friendly to batsmen, the Australians had given a first outing to the five bowlers - Harris, Siddle, Copeland, Lyon and Beer - called up exclusively for Test match duty. A handful of spectators were treated to the rare sight of Ricky Ponting running drinks as he was spelled from tour duty alongside Mitchell Johnson, Shane Watson and James Pattinson. There were a few bowlers in need of them as the humidity drew plenty of sweat, but neither Harris nor Copeland were able to draw edges in their opening bursts despite beating the bat consistently. More runs had accrued from the edges of the bat than the middle by the time Lyon was introduced for his first bowl in front of Clarke, who would have been entitled to ask 'and what is it that you do?' before handing him the ball. Lyon gained some turn from the start and demonstrated the enticing loop that had so encouraged the national selectors, but he also dropped short, either side of a brief rain delay, as Paranavitana and Lahiru Thirimanne neared lunch. Their stand was broken by what became the final ball of the morning session when Thirimanne edged a Copeland delivery angled across him to be caught behind for 32. Copeland is the most dependable of practitioners, hitting the same awkward line and length ball upon ball with a little movement either way. His pace is strictly medium, but swift enough to prevent most batsmen from surviving if they miscalculate. With a method minted for long-form cricket, he looks like a Test bowler. Soon after the resumption Paranavitana played back to Copeland when he might have been forward to a ball that straightened, and was given lbw. A partnership followed between Chandimal and Bhanuka Rajapaksa in which the former played the aggressor, dancing down to loft Lyon over mid-on. Unsurprisingly it was the probing Copeland who broke the stand, coaxing an edge from Rajapaksa that was again held by Brad Haddin, this time diving superbly low to his left. This created an opportunity for Harris to exploit, which he did in the following over when Chandimal sliced a loose back foot push at a ball delivered from around the wicket to gully. From 171 for 4 at tea, Mathews was soon beaten on the back foot by a Copeland delivery that arrowed into him and may have kept a fraction low, before Thilan Samaraweera lashed out wildly at a rare wider offering from the same bowler and was caught behind. It was Copeland's fifth haul of five wickets in 18 first-class matches. Silva squeezed Beer to silly point where Khawaja held a neat catch, and Lyon claimed a victim when Kosala Kulasekara swung to deep midwicket. Dilruwan Perera's inside edge onto pad was snapped up by Haddin, and Harris deservedly collected Thisara Perera after a nuisance partnership of 49 for the final wicket. Neither Lyon (1 for 71) nor Beer (2 for 39) were particularly mesmeric, though the offspinner turned the ball past the bat more than once and drew the local batsmen down the pitch more readily than his left-arm orthodox counterpart. Nevertheless, Beer bowled tidily after tea and chimed in with a pair of wickets to finish the day with more attractive figures. Haddin held five catches, one of them brilliant.